How do I register for Online Paperless Billing? If you are already signed up for a city service, you will use the same eServices login (email) for the online paperless billing site. 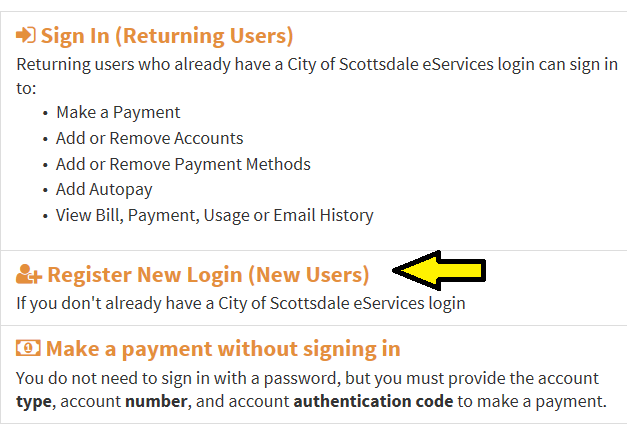 If you do not currently have a city login, visit https://eservices.scottsdaleaz.gov/olpp and select “Register New Login,” then fill out the required (*) fields to register. You will then receive an e-mail confirming your registration. Your city eServices login will be the same for all city websites that use this feature. Once your registration is complete, you can return to the page listed below and select Sign In to proceed to the online paperless billing site. Registering for eServices allows us to authenticate your email. This ensures that you will receive all communication regarding your city accounts in a timely manner, as well as any other city services using the eServices login. What if I don’t want to register, can I make a payment? Yes, you will still be able to make a payment using the “One Time Payment” feature. *Note – you cannot post-date payments. You will need to provide the account type, your email address, your account number and your PIN number/house number. What if I don’t receive the confirmation email after registering? If you do not receive your confirmation e-mail, check your spam folder. 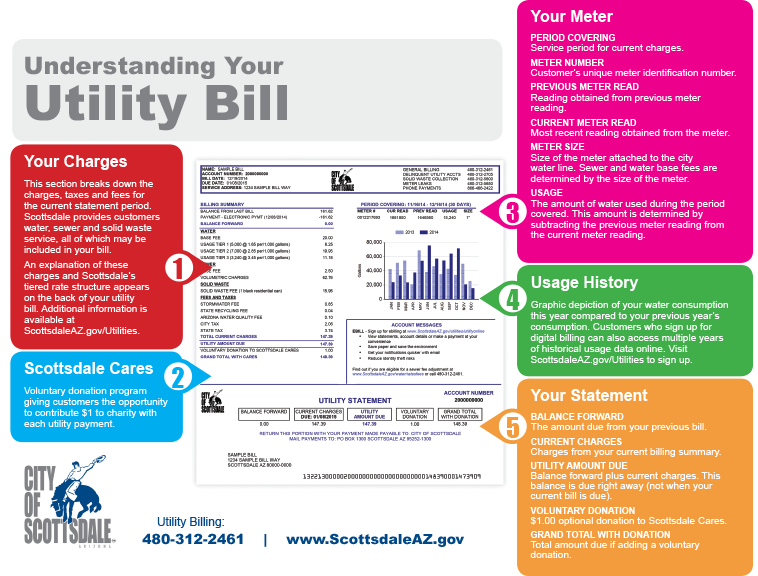 If you are still unable to locate it, please call Utility Billing at 480-312-2461. How do I change the e-mail address associated with my Online Paperless profile? 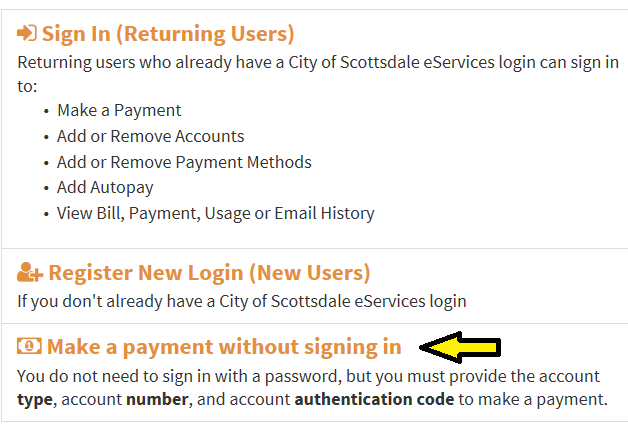 Sign in to your online paperless profile at https://eservices.scottsdaleaz.gov/olpp and click on the image that looks like a person (next to the Log Out button) on the top right portion of the screen. If your new email address has not been registered with the city yet, you can click on HELP, and select Change Email Address OR you can click on the image towards the top of the page, next to the Log Out button, that looks like a person. If your new email address is already registered with the city, you will have to contact the city for assistance. Use the “Contact Us” link, under Help, to find the appropriate area for your Account Type. How do I obtain a PIN (Personal Identification Number)? There are three ways to set up a 4-6 digit PIN. No, at this time the online paperless billing site does not allow for credit card payments. However, you can go to https://secure8.i-doxs.net/Scottsdale/OneTimeValidate.aspx and use your card to pay your utility bill. You will need your account/customer number and house number/PIN to utilize the site. There is a $1.95 convenience fee per transaction with a maximum payment amount of $300 per transaction for using this service. How do I cancel a payment that has not yet been withdrawn from my account? Note: If the payment was made using the “one-time payment” option without logging in, you will need to call , as it cannot be canceled online. 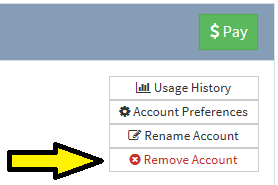 Go to the “account details” screen, and if the payment still has a ‘SCHEDULED’ status, you can still cancel it. If your payment is still Scheduled, you will see a red “Cancel Payment” button next to the payment info. On the right hand side, under the “Pay” option, you will see a menu. The last item is “Remove Account.” Select that and go through the steps to remove your account from the Online payment system. What is the difference between Autopay and Surepay? Both programs are initiated by the customer and are for recurring payments. Payments are withdrawn electronically from a Checking, Savings or Money Market Account on a recurring basis. Autopay is initiated from an online source (Paperless Billing); which allows the customer to manage the program options online. Surepay is initiated from the customer but NOT from an online source. A Surepay customer must complete a form and include a voided check or deposit slip and submit the form to the City of Scottsdale by mail, fax or in person. Any changes to the Surepay profile must be submitted in writing to the City of Scottsdale. Consist of a monthly base service charge, which is determined by the size of the water meter, and a monthly quantity usage charge, which is based on the amount of water used. consist of a monthly base fee, also determined by water meter size, and a monthly volumetric charge calculated by multiplying 90 percent of the customer’s average consumption during the low-watering winter months of the prior December, January and February. Meter Installation, Meter Bench Test, Water Main Shutdown, etc. Scottsdale’s Solid Waste Division can provide a full range of trash and recycling collection services for businesses, contractors and multi-family residential developments in Scottsdale. Please contact Revenue Recovery to discuss payment hardship options. The Scottsdale Water Citizen Academy provides an inside look at all aspects of your city’s water utility, which happens to be one of the most advanced municipal water systems in the country.